LF: What is your cycling background? AC: I started cycling when I was 15 after watching the Sydney Olympics on a rainy day in a caravan whilst on holiday with my family. I made the impulsive decision that, one day, I wanted to be at the Olympics. I decided that cycling looked pretty easy, so the next day I jumped on my dads mountain bike and rode 4km to the shops. It nearly killed me. I persevered and rode my 1st season as a junior in 2005 seeing progression in leaps and bounds as I did more and more races. After racing in Belgium and riding the Junior Tour of Ireland I decided that I wanted to race abroad. I rode one season as senior in the UK to finish my A-levels and then heading to France. Here I proceeded to get battered into the ground week in week out riding Elite Nationale and UCI 1.2 races. After a tough first season in Alsace I moved west to Brittany where I enjoyed a much better year. My French language progressed with my racing and I began to settle in to the racing scene. After a great 2009 I moved to a big team in 2010 in the hope of really moving up to the top level of racing. Unfortunately a skiing accident at a training camp in January meant I only began racing in July, but I still had a great end of season getting on the podium several times. After this I scaled back my racing and started university in France before joining La Fuga. I’ve visited and ridden or raced in practically every region of France and enjoy it immensely. LF: When did you start working for La Fuga? 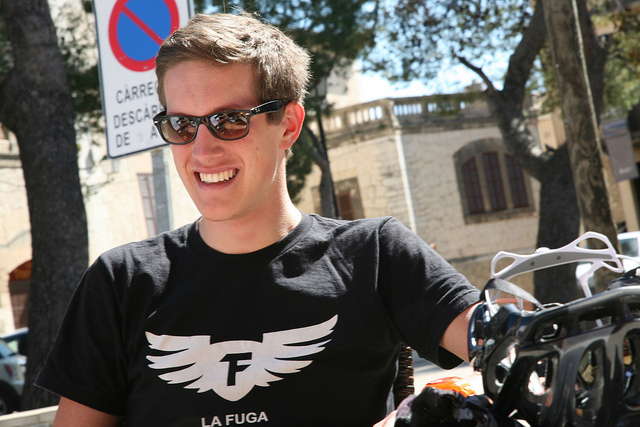 AC: I started with La Fuga in June 2011, I had known Ian (creator of La Fuga) for a while having raced with his brother, Simon, at junior level and raced on the same team as him (Felt Racing) in 2007. He began La Fuga the year I started racing in France and the growth of the company ran concurrently with my education in French racing and culture. I had always been too busy with racing to offer my services until I did, but once I did I enjoyed it so much I carried on! LF: What bike are you riding this year? AC: This year my bike is the same as our Rental Fleet, that being a Specialized Tarmac SL3 Expert. I’ve ridden Specialized for 4 out of my 8 cycling seasons now and I wouldn’t hesitate to recommend them. I especially like the stealthy matt black paint job this year. I wouldn’t say I’m the best of cycling mechanics, I’ve learnt my fair share and know more than your average Joe, but as long as the bike works I care more about how it looks! LF: What’s your favourite aspect of working for La Fuga? AC: Whilst obviously I love the riding, the great hotels and amazing food, my favourite part about working for La Fuga is the variety of people I get to meet and talk to. A La Fuga guest is generally a successful person and for me it’s always interesting to get an insight in to how they arrived where they are, when and why they started cycling, where they’re going next. I’ve spent many an hour chatting to fugisti on mountains and valley roads around Europe and with such an array of backgrounds, nationalities, professions and personalities there’s always something to talk about. LF: What’s your favourite climb on a La Fuga tour? LF: And your favourite (or least favourite) descent? AC: A tricky one. I’ve ridden so many great descents on so many La Fuga tours that it’s difficult to pick one out. One of my favourite descending experiences though was during our Rapha Randonnée Alpine in September last year. We met Andy Hampsten (first non-european winner of the Giro d’Italia and winner of a Tour de France stage to Alpe d’Huez, our destination that day) at the top of the Col du Glandon after I’d inadvertently blasted past him, not knowing who he was, as we reached the top. We chatted for a while before he left with what must be his tag line (and my new philosophy)…’Go Fast, Take Risks’. Whilst usually I’m a very responsible guide, the opportunity to descend with a legend of cycling doesn’t come around all that often. So as my group came up to his I eased past him on a corner with a manoeuvre clearly designed to goad him into following me. I knew his racing brain wouldn’t be able to resist the offer and he took the bait. Once I turned around and saw him on my wheel it was full throttle from there on. We both duly forgot about our guiding duties (hey, there was only one road to go down?!) and blasted down the mountain. Once we eventually decided that enough was perhaps enough, it was a nice moment as he rode along side and said ‘That was a lot of fun’. LF: What’s your favourite hotel experience on a La Fuga tour and why? AC: Obviously the fantastic hotels are the big bonus after a long day in the saddle or drivers seat. Whilst I enjoy the majesty of the big 5* hotels, there’s a lot to be said about the smaller hotels along some of our routes. My personal favourite is the Chateau de Beauregard on our Rapha Randonnée Pyrenean. This small, renovated chateau is set in a very quiet location on the outskirts of St Girons. The rooms have kept their quaintness whilst still being comfortable and the Spa is incredible. The restaurant is also a fantastic experience with a huge log-burning fireplace that gives the renovated barn an incredible atmosphere. The service is always great and the breakfast superb with a selection of warm breads, jams and cereals. Top Notch! LF: What are your interests outside of cycling (if any)? AC: As anyone who’s been a full time cyclist will know, there’s a lot of downtime…a hell of a lot. I used to fill mine with playing a few instruments, reading rubbish books and Wikipedia pages and the occasional piece of art. The university I went to in France was actually L’Ecole des Beaux Arts, or school of fine art so it’s always been a general interest of mine (although the fact I only managed one year is telling of the fact it isn’t all I want to do). Now though I barely have time to think, so organisation is the name of the game and my artistic needs have to be satisfied through the quick and easy medium of photography! LF: What are you most looking forwards to in 2012? AC: I think this year is lining up to be a great one. Last year I came in with no idea about what went on behind a La Fuga tour and was just there to make sure we didn’t forget anything and that the trip went smoothly. This year I’ll be seeing trips through from conception, to organization, to execution and I think that is the most exciting thing for me. Something I’ve been working on more personally has been a custom tour across the Pyrenees for a group of guys coming from Australia. Over 12 days in August with two rest days and more mountains than you could shake a stick at, it’s a really exciting trip that I’m hoping will run as smoothly as possible! Most Surprising Food: Aubergine, wrapped in an anchovie, wrapped in smoked salmon – on paper, surely this is the recipe for horror, yet it was absolutely incredible. LF: What’s your cycling background, when/how did you start? 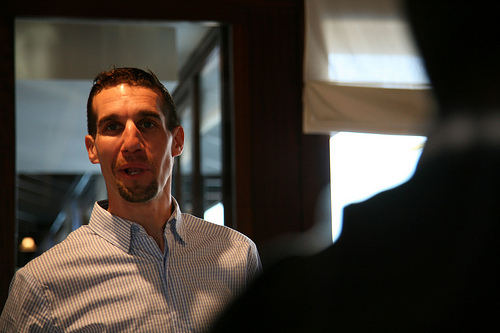 JS: I started playing on bikes as a recreational mountain biker, but gave triathlon a shot in 2000. I was very fortunate that Winnipeg had an incredible triathlon scene (not true for cycling in general there) and my best friends & training partners were multiple-time national champions who pushed me to achieve a level that I never would have thought possible. After quickly realizing that long-course didn’t suit my strengths, I focused on Olympic distance tri, despite never being a particularly good runner, I earned some pleasing results – including the very odd achievement of going sub-2hr at one race, without going under 40-min on the run. LF: How long have you been working for La Fuga? JS: My first trips were in the 2010 season, but I quickly realized that this was a company and experience that I wanted to be involved with. In April of 2011, I came on as a full-time member of staff and since passing my first winter with La Fuga, putting all of the plans in place for the upcoming season, I am truly looking forward to seeing what we can deliver in 2012! JS: I’m on a 2012 Specialized Tarmac SL4 S-Works frame… just like Tom Boonen! We both run SRAM drivetrains too, but as someone who’s always been a bit obsessed with getting all of the little things right, I took a pass on his Zipps and picked each part for my perfect handbuilt wheelset. JS: What’s your favourite trip to have worked on so far? LF: Thus far I’ve actually worked relatively few of our Sportive trips (in fact, I have yet to see either the Maratona or the Marmotte! ), so I’ll keep those off my list for now. While I absolutely love the Randonnée routes and the experiences that we get to share in, as each group unites to cross what would normally seem like an insurmountable feat, I think it’s the addition of the coaching aspect, which allows just that much more connection to our guests for each week, which keeps our Majorca Cycling Academy at the top of this list for me. Each week I’ve spent in Majorca has been so incredibly rewarding that I can’t think of a better way to start our season. LF: Describe your typical week working for La Fuga in the winter? JS: In an ideal world, there would be an off-season, so it’s a bit odd to think that the winter months can often feel busier than summer. Long hours are spent putting together the best routes with the perfect hotels in the ideal locations, and it’s incredible how rewarding it can be when you see it all come together (I can’t wait to see how our custom Paris-Nice Tour goes!). Winter is also the only time that we get a chance to actually train on our bikes too, so the weekend miles rack up quickly and the Tuesday night chaingang is a must… even in the dark! LF: And in the summer? JS: It’s hard to say where I’ll be at any given point of the season, but chances are it’s somewhere I would have dreamt about in wonder when I was stuck on the turbo-trainer in the middle of a Canadian winter. Certainly the days are long and the work can be tiring, but the reward of sharing such amazing experiences with each guest or just having those ‘this is my office’ moments out on the road more then make up for the effort. LF: What is the craziest thing that’s happened to you on a bike while working for La Fuga? JS: Our Rapha Randonnée Alpine this past June was an incredibly hot trip – it seemed we hit 40deg at least once a day on the whole trip. On day one, as we rode up the first proper mountain of the route (Col du Columbiere), one of our guests was experiencing some terrible cramping. I didn’t want him to have to give up on achieving the full Randonnée ride, so I ‘brought out the turbo’ and we rode together up the final 4k of the climb. Anyone who’s seen the Columbiere knows how tough that last 3k stretch is, especially as you can see every inch of it. Now imagine it in 40deg heat, with nowhere to hide from the sun. Unfortunately, as I pushed up the mountain, I wasn’t really thinking of the effort I was putting out… until we reached the top. 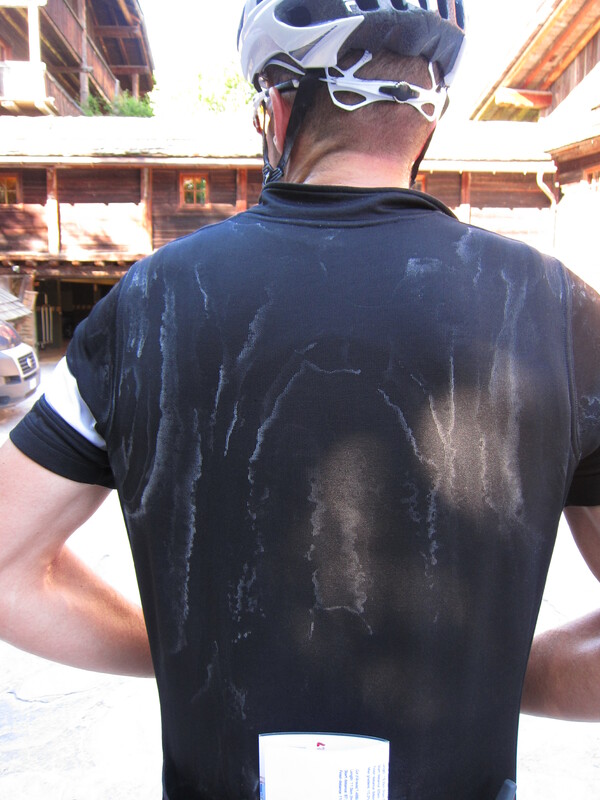 I was completely knackered and we still had ~50k to ride, including the Col d’Aravis. I believe I went through 10-12 bottles that day and still have no idea how I managed to just keep pedalling for the last hours, but I sure am glad that no one felt the need to test their legs on the Aravis!! LF: What is the craziest thing that’s happened to you off the bike while working for La Fuga? JS: On the pick-up day of one of those few sportives that I’ve managed to work, there were plenty of bikes to build and check over after dinner, to ensure they would be in perfect shape for the trips up and down the mountains that weekend. The hotel’s doors officially closed at midnight, so as I worked away into the night, the head of reception came past to let me know that they had officially locked up, but gave me the code for the front door. Despite my fluency in French and repeating several times what I understood the code to be, it was all rather horribly miscommunicated – I won’t get right into it, but if Manuel had been French, it could have been a Fawlty Towers episode. So there I am, it’s 2:30am, and I have finished the prep on each bike and am feeling quite satisfied that a good job had been done. I returned to the hotel to find I was locked out and a bit annoyed… but still resourceful. So, dressed in my black Rapha top and black Rapha shorts, with my black toque (edit – for those that don’t speak Canadian this is in fact a beanie hat) and the right tunes going on my iPod to accompany me, I proceeded to case the joint. After confirming that there were no secondary entrances that were acceptable, I remembered that I did at least have a room with direct access to the inner courtyard, so just had to get there… and so I summoned my inner-Romeo, climbed a balconies or two and made it over the hotel! 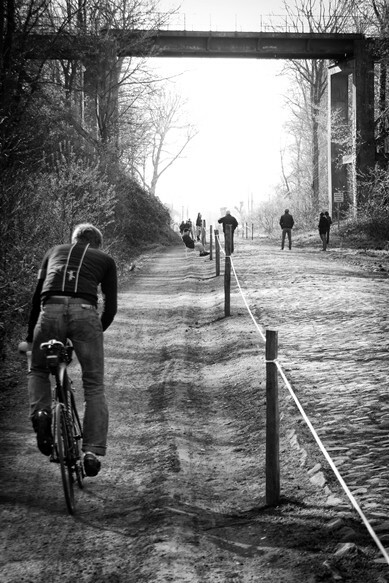 LF: What is the best climb you have ever ridden whilst working for La Fuga? JS: I’ve ridden so many great climbs that it’s incredibly difficult to pick just one. The Cime de la Bonette might get the honour, simply because there is just so much to enjoy, including the conversations on the way up – the climb has so many different looks to it that it seems every corner unveils something spectacular and new. That said, while it is by no means the largest climb we include on our tours, I love the abandoned beauty and scale of the Col de Sarenne. It helps me to remember how important this world is to my life (that sounds ridiculous now that I’ve typed it, but maybe you know what I mean), as the phrase ‘broadening your horizons’ could never be more relevant. JS: It’s a tough pick, but it’s definitely down to one of three – the Col de Marie-Blanque was the first descent I fell in love with, which is a special thing to say given that I was driving a Berlingo at the time. Once I finally rode it, I couldn’t have been happier, as the corners simply flowed from each other… but watch-out for that one right-hander as you approach Bilheres. The second great descent is the little-known Col du Castillon, which again has incredible flowing corners, allowing you to maintain magnificent speed as you connect the twists and work your way down to the Med. 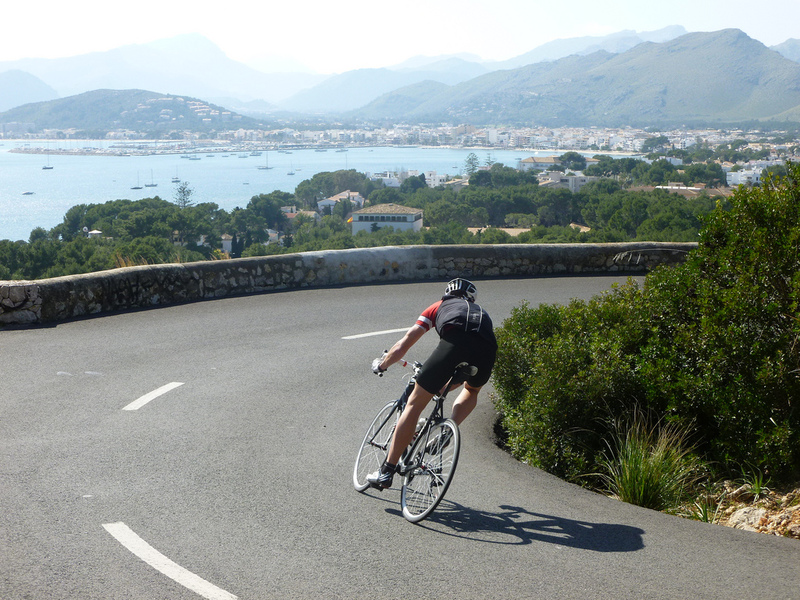 Finally, no list would be complete without that descent into Sa Calobra out in Majorca. I don’t have the best history with this one, but did manage to exorcise a few demons during my 2012 visit and that road is simply magnificent. LF: Which has been the nicest hotel you have stayed in whilst working for La Fuga and why? AC: As a general rule, I find that the biggest difference between hotels often comes down to their staff. Working for La Fuga, I have the great fortune to stay at incredible hotels, night after night, but often only for a day at a time. As such, the ease in dealing with the staff and their ability to understand our often unique requirements often makes the difference. With that in mind, The Hotel du Palais (5* start hotel for Rapha Randonnée Pyrenean) is simply incredible as there isn’t a request that the staff can’t assist with, as they truly understand our commitment to providing whatever we can to assist our guests. As an added bonus, I always make sure to get up a half-hour earlier then needed, so I can enjoy some relaxed time at breakfast, watching the waves crash on the Atlantic coast and sipping the best orange juice I’ve ever had! LF: What are you looking forwards to most during the 2012 season? JS: The new tours that we’ve put together, both scheduled and custom, for the upcoming season are going to be a great interest to me this year, but I think the one aspect that I’m most excited about are the new staff members who we’re bringing in. As mentioned above, it can be pretty tough work to ensure that all of our Tours run to the level we aim to achieve, so finding the right people with the shared knowledge, experience and passion has been paramount. You’ll certainly see some familiar faces on your La Fuga trips this year, but I’m really excited for you to meet our newest recruits too. After all, two seasons ago, that was me! With the Olympics coming to London and more and more people than ever keen to take to the roads, 2012 looks like it could be the biggest year for cycling to date. That’s why we teamed up with our bicycle and navigation partners Specialized UK and Garmin UK to offer the ultimate prize to get one lucky winner kitted up and out riding on some of Europe’s fantastic cycling roads. The competition ran throughout November and December and we are pleased to announce the lucky winner is Danny Whiteside. Danny was selected at random from thousands of online entrants who successfully answered the question “On which bike did Mark Cavendish win the 2011 World Road Race Championships?“. The answer, of course, was the Specialized flagship road bike, The Venge. 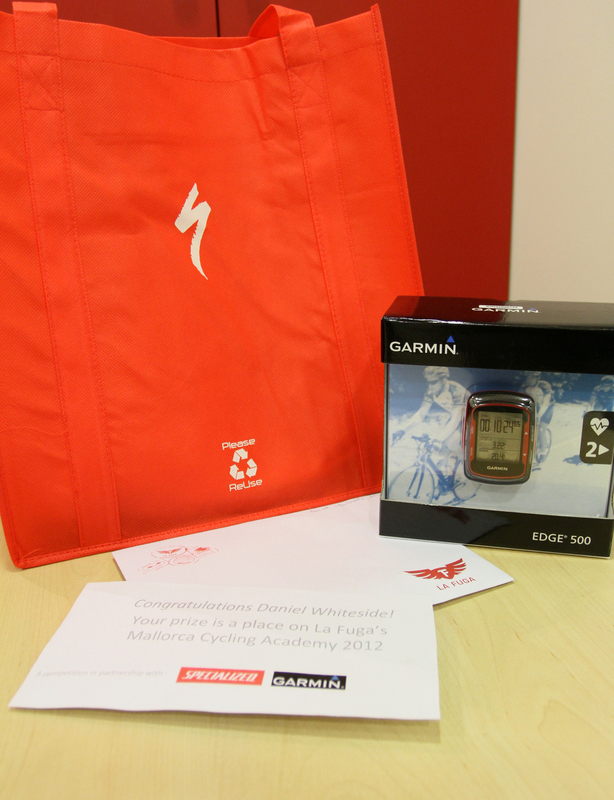 The fantastic prize offered was a Specialized Secteur Elite 2012 road bike, a Garmin Edge 500 cycling computer and a week at La Fuga’s Cycling Academy in Mallorca in mid-March. The aim of the prize was to give the winner the essential equipment and the opportunity to put it to great use on the beautiful and challenging cycling roads in Mallorca. The Secteur Elite is an entry level, affordable road bike but still offers design features, comfort and quality equipment found on models higher up the in the range. The Secteur Elite is a great bike for those who are keen to get a bit more into road cycling. Add to this the Garmin Edge 500, an all round lightweight cycling computer recording everything from altitude to GPS location plus the ability to share your workouts online via Garmin Connect. The Edge 500 will give the enthusiastic cyclist who is keen to improve the right tools and information. With the essential kit in place the next step it to get out and use it and what better way that on the La Fuga Cycling Academy. 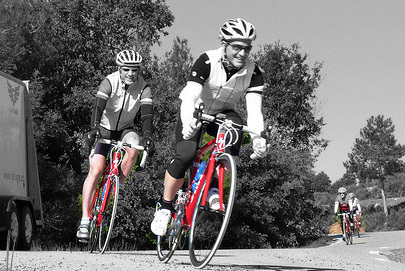 The Cycling Academy is a completely new approach to Spring riding. Specially conceived for new cyclists and riders looking to improve, our residential Cycling Academy is the perfect place to hone your fitness and riding skills. Over the week the focus is on high quality coaching and fully supported rides to take your cycling to a new level. Features of the Cycling Academy include fully supported group rides catering for all abilities, skills sessions focussing on areas such as descending and group riding, and seminars on key subjects such as nutrition, to really boost your all-round cycling skills and fitness. 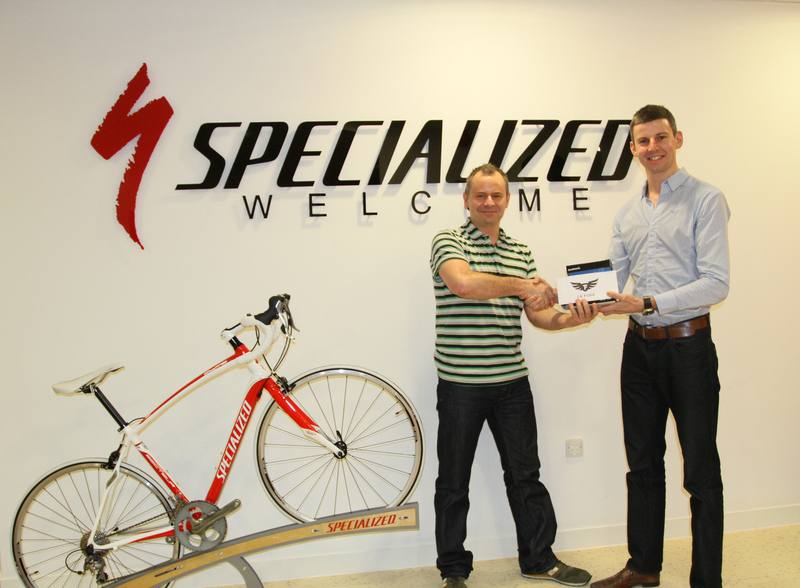 Danny visited Specialized UK headquarters in Chessington, south west of London to collect his prize and was met by Emily Hamilton of Specialized and Cameron Fraser of La Fuga. Emily and Cameron also presented the fantastic prize offered by Garmin in their absence. Sadly, Danny had ran out of annual leave at work but he has generously gifted the Cycling Academy trip to a fellow colleague at BSkyB, Nick Dodds. Nick has been riding for a few years but a recent knee operation has meant that he has had to learn to cycling and train all over again. And what better place to be able to do that. Thanks to everyone who entered the competition and stay tuned for a post-Mallorca write up. After a seasons service we are selling our trusted fleet of hire bikes. All of these bikes have a great spec, minimal use and are in great condition after being serviced regularly by our professional mechanic. They will be serviced again before sale so you can guarantee a great ride. 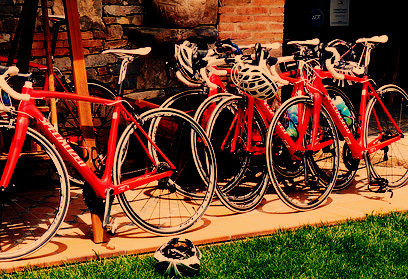 The bulk of our fleet is made up of Specialized Tarmac SL3s with a limited edition ‘American Flyer’ red paint scheme. These come with a full Ultegra groupset and fulcrum 4 wheels with an original value of £2,849.99. We also have two Specialized Roubaix SL3s available in blue and white with the same spec also with a value of £2,849.99, as well as one Specialized womens specific Ruby in black and pink with shimano 105 with a value of £1,649.99. These bikes will be available for pick-up/postage once they arrive in the UK at the end of October. If you are unable to pick-up from our offices at Sigma Sport we can offer a postage service at a cost of £25 for UK delivery. For Overseas postage prices please give us a call for a quote. If you are very keen to have yours sooner we can offer a selection of sizes from our European HQ with an added postage cost to the UK (or wider world). We will ask for a £250 returnable deposit on reservation. 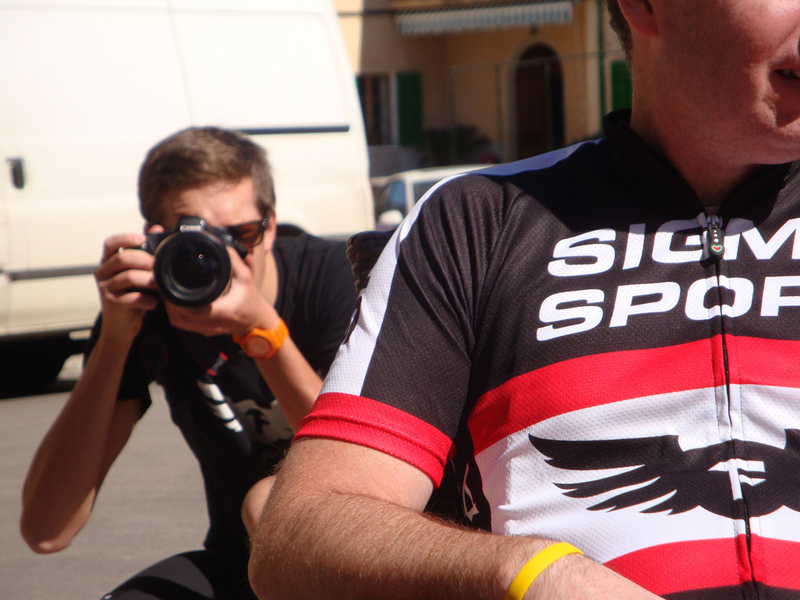 Team Sigma Sport – Specialized have just returned from their first warm weather training camp of the year, based in Tuscany, Italy. Here’s what new team rider Tom Copeland had to say about the trip. Thanks to La Fuga, the team headed to the renowned hotel complex – Hotel la Buca Del Gatto – which caters especially for cyclists. We were one of four teams staying there at the time with other Italian amateur teams adding to the mix and giving some competition for the after-ride buffet stand off. 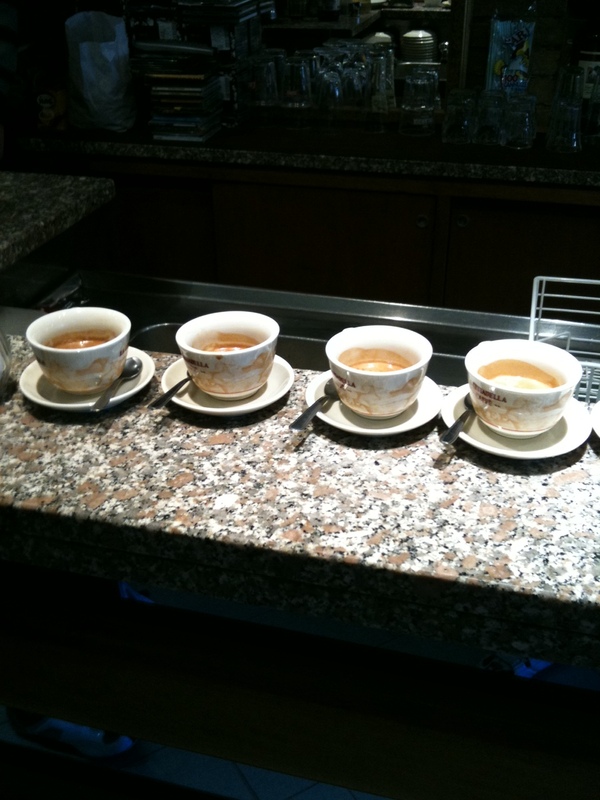 The hotel was perfectly suited for the needs of riders, with fresh food aplenty, spa facilities, spacious rooms, more resembling apartments than hotel digs, and most importantly good coffee. The team realised how cycling orientated the place was when Paolo Bettini casually strolled up to the bar one evening and greeted the staff like friends. Nobody asked for autographs, although some looked very tempted! With seven days of training in the rolling Tuscan countryside, this allowed for two solid blocks with a well earned easy day mid-week. Conveniently the rest day was the wettest day of the stay. Was this planned as well?! The Tuscan roads are perfect with very little traffic to deal with and a great mix of flat, rolling and hilly roads with some long climbs allowing the team to perform some long efforts to test the form. By the end of the week everybody looked ready for a few easy days! At the end of Tuesday’s 175km route the team impressed by still being able to hold nearly 60kmh on the run in, forming a smooth through-and-off train. Matt ‘the boss’ Stephens was looking strong as the speeds ramped up, showing he still hasn’t lost any of his strength! New recruits Russell Hampton, Steve Lampier and myself held the wheels and have already integrated well into the team. 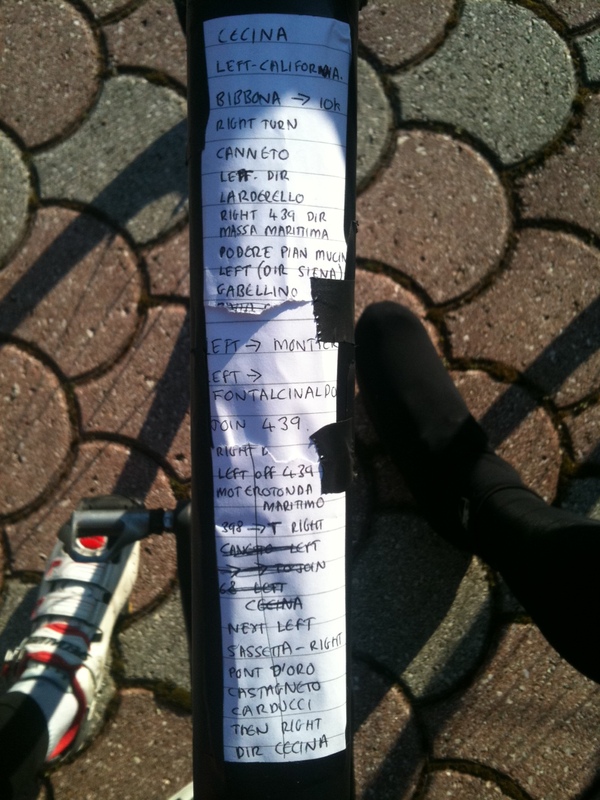 Showing his “old-school” tendencies, Matt brought out the “Matt-Nav” to help with navigational duties..
With the start of the season upon us, everyone looks keen and ready to ride à bloc. Wouter Sybrandy has been racing already – with several time trial wins and course records. Clearly in-form, the tall Dutchman was the stand out rider of the week. Weighing in at 80kg, a tower of pure muscle, showing everybody up on the climbs – even putting the whole Landbouwkredit team to shame in a UK-Belgium showdown up the climb to Volterra. Last years Kuurne-Brussels-Kuurne winner Bobbie Traksel was one of many to be put to the sword by the Flying Dutchman. A total of over 900 km was covered with over 28 hours in the saddle. 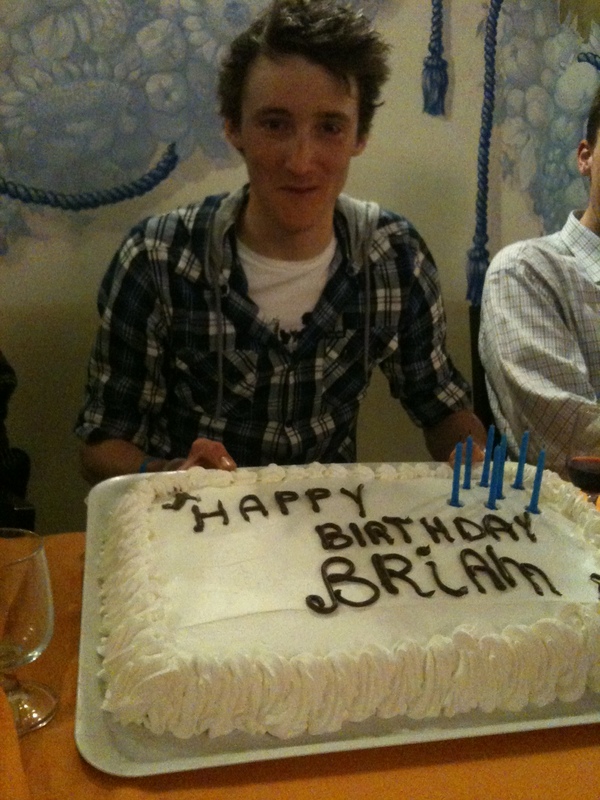 Rounding off the week was my birthday! Acquiring a new moniker “Brian” we celebrated on the final evening, meaning that dessert was finally on the menu after what had been a more ‘athletic’ diet so far. The training camp was timed perfectly allowing the riders a short rest before the racing kicks off this weekend with the Clayton Velo Spring Classic followed by the Eddie Soens Memorial on the 5th March and the Severn Bridge on the 6th. The Severn Bridge is team leader Si Richardson’s local race which was won last year by Surrey Hills and La Fuga Club Run guest Phil Sykes. These races will allow the team to get some speed through the legs before heading over the channel for the UCI 1.2 Paris-Troyes race on the 13th March.